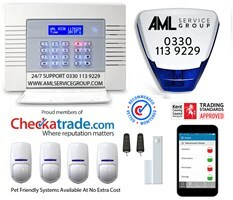 AML Service Group Europe Ltd - Alarms/Security based in Kings Hill , Kent . We are a family run company based in Kent covering Kent, Essex, London and the surrounding counties. We specialise in the security industry but we also cover multiple facilities management contracts across the south east. Please feel free to contact us for all of your security needs.